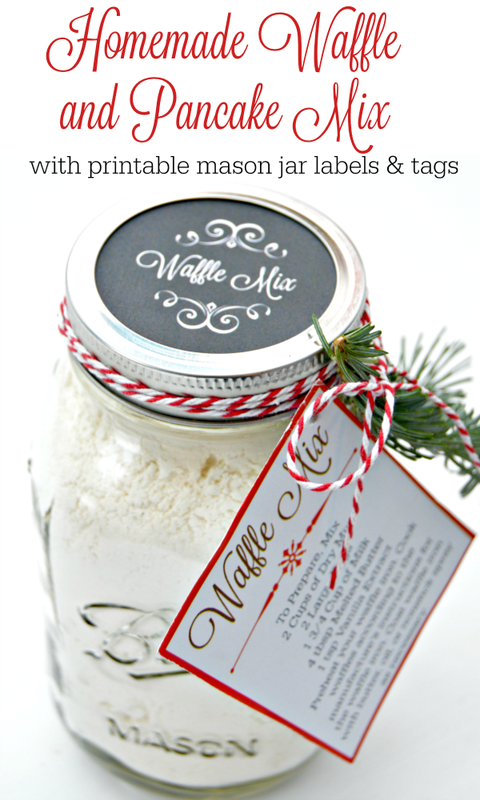 This homemade waffle and pancake mix with free printable mason jar lid labels and printable instruction tags is my go to gift to give this holiday season! I love giving homemade gifts for Christmas! 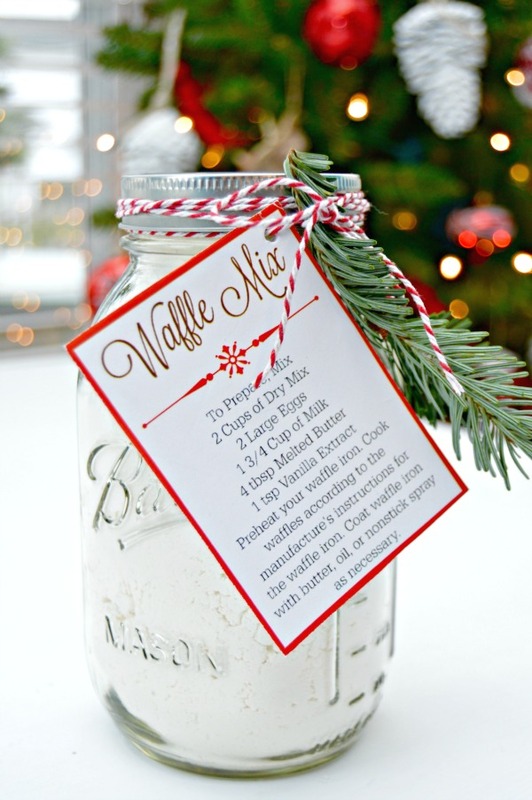 Last year I made Homemade Hot Cocoa Mix with Mason Jar Printables and Peppermint Sugar Scrub with Labels too…those are still on my gift giving list for this year, but I’m adding something else too! 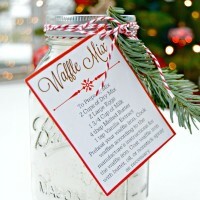 This year I’ll be gifting some Homemade Waffle Mix with Chalkboard Mason Jar Lids as well as Printable Instruction Tags! To make the waffle and pancake mix, follow the directions below. Don’t forget to print out the free printable Mason Jar lid labels and the Free Cooking Instruction tags too! 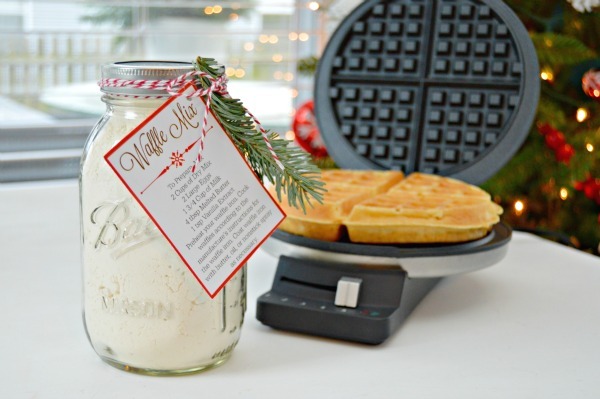 This homemade waffle mix is delicious and makes the perfect gift too! To make dry mix, sift all of the dry ingredients together and store in airtight container for up to one year. For the Waffles: Preheat your waffle iron. Prepare the batter as you would for the pancakes — no need to rest for waffle batter. Cook waffles according to the manufacture’s instructions for the waffle iron. Coat waffle iron with butter, oil, or nonstick spray as necessary. For the Pancakes: Give the mix a good shake, then measure the amount you need and transfer to a large mixing bowl. In a liquid measuring cup, whisk together the milk, eggs, butter, and vanilla. Slowly pour the milk mixture into the flour mixture while stirring. Whisk until smooth. Let rest for 10 to 15 minutes. While the batter rests, heat your griddle or large nonstick pan over medium heat. Once hot, coat pan or griddle with butter or nonstick spray as necessary. Pour about 1/4 cup of batter onto the hot griddle for each pancake, spacing the pancakes a little apart. When you see large bubbles begin to form and pop on the surface after 2 to 3 minutes (not just on the edges), flip and cook until done. Doesn’t it make the cutest gift ever? Adding the chalkboard Mason Jar tag to the lid and the Printable Instructions makes it the perfect gift! You could even tie a wooden spoon to the waffle mix instead of the greenery I used. Pair with a waffle iron for a really special gift! 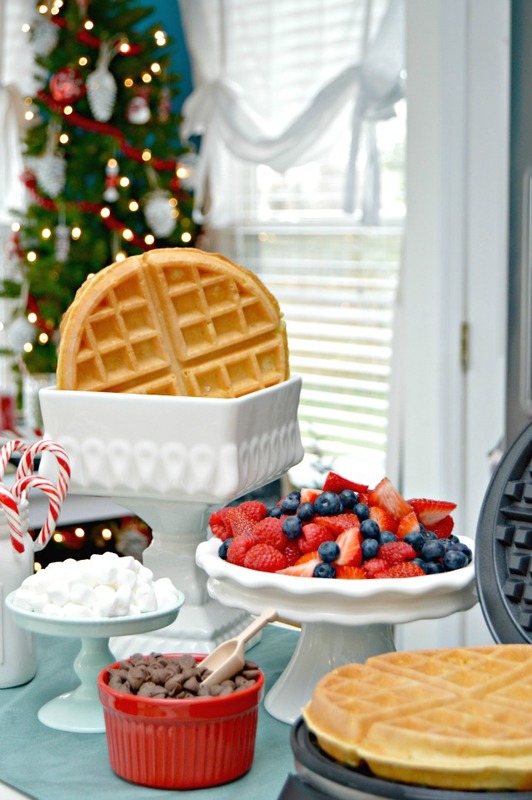 You can also check out my Homemade Waffle Bar HERE with the cutest Kid’s Holiday Table that we set up! I hope this post gives you some fun holiday and gift ideas! I AM CONFUSED ON WHAT GOES IN THE BOTTLE AND THE RECIPE ON THE CARD.?? ON THE DRY MIX, DO I MIC ALL OF THAT UP AND DIVIDE IT INTO MASON JARS?